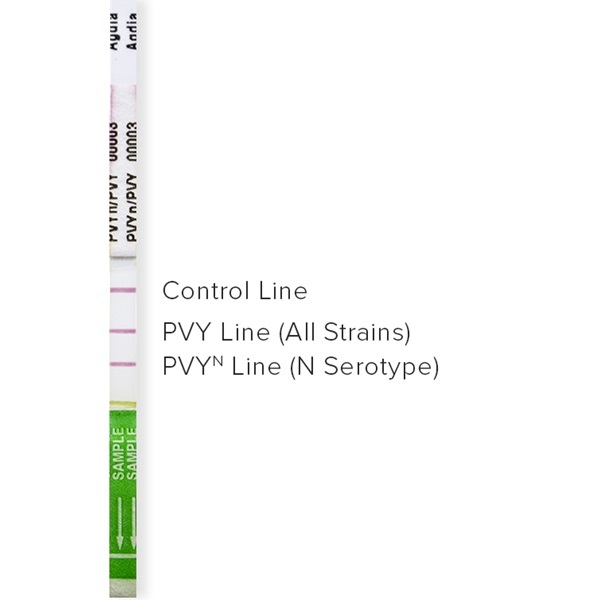 The PVYN / PVY ImmunoStrip® is a multi-line assay that not only identifies the presence of PVY, but also indicates whether the PVY present in a sample is a necrotic strain of the virus. This assay contains two test lines as well as a control line to indicate the test worked properly. One of the two test lines can detect all PVY strains while the second test line detects only PVYN serotype strains as well as PVYO5. If both the PVY and PVYN test lines are visible, the sample is infected with a PVYN serotype strain (N, NE11, NaN, NTN) or PVYO5. If only the PVY test line is visible, the sample is infected with a PVYO serotype strain (C, O, N:O, N-Wi). If only the control line is visible, this indicates a negative result for all strains of PVY. This test is a rapid diagnostic tool that has enhanced value for PVY disease management programs. Potato growers and inspectors can identify PVY in the field and assess whether a plant has a higher risk of developing potato tuber necrosis disease (PTNRD) associated with PVYN recombinant strains.